No nativity is complete without the wise men coming by camel to bring their gifts to Jesus. Am I right? 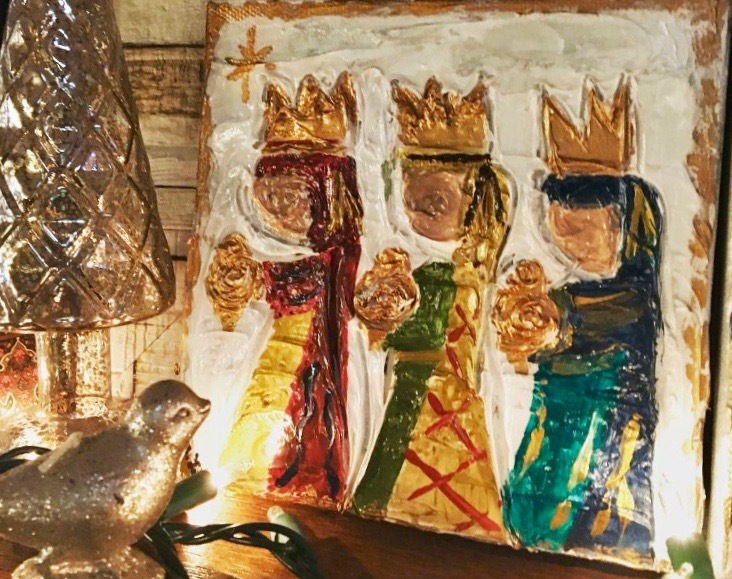 Matthew 2 tells us the wise men followed the eastern star and when they found the baby they worshipped him and opened their treasures and presented Him with gifts: gold, frankincense, and myrrh. Notice that they didn’t bring a whole convoy of objects. They brought a representation of their very best gifts. They chose to bring quality over quantity. They presented Him with the things that they truly treasured. What is it that you treasure? Take a moment to think about it. What would your gift be and how you can present it as an offering to your King today? It doesn’t have to be elaborate or perfectly wrapped. It just needs to be meaningful. Maybe it’s taking the time to serve at the local soup kitchen and offering a kind word to those you meet. It could be as easy as slowing down enough to listen to someone who is struggling this season. Or it could be as difficult as giving up that treasured parking spot you’ve been waiting on at the mall (gasp!). Don’t let the hustle and bustle of the season rob you of bringing your very best gifts. Resolve to choose quality over quantity. And remember, when you take the time to love others in His name, you bring something so valuable: a treasure fit for a King.